EcoDecors is proud to add this to its VillageCraft line of decorative furniture and home décor. We personally travel to small villages throughout the island of Java in Indonesia looking for unique items made by local artisans to add to our line. Our travels take us to back alleys, and small rural villages where you find workshops by listening for the sounds of woodworking. Many of these items are produced by families in small workshops. We purchase directly from the crafts people in small batches with care and pride of workmanship. EcoDecors strives to find and design functional works of art that can act as home accents and décor, with a functional purpose. We strive to bring out the rich natural materials used in the construction of these products. These indoor benches are not made in modern factories and each piece reflects that complete with minor imperfections. Regardless of where you place this it will be sure to be a conversation piece with all your friends. 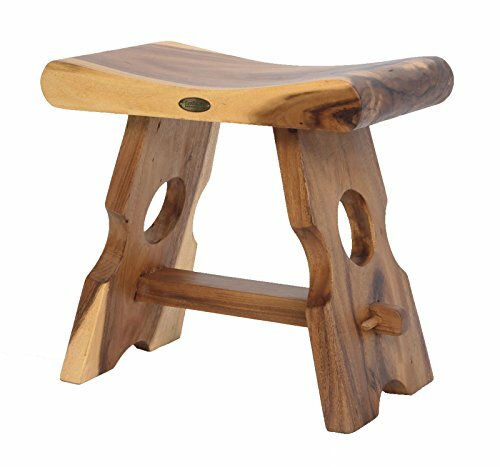 This is hand constructed from a local Indonesian hard wood that is commonly used by local villagers for handicrafts and furniture. This wood is NOT appropriate to leave outdoors for extended time periods. You can not find a more unique and stunning conversation piece as a house warming gift for your friends. Each piece has unique attributes due to it being hand made without the use of modern factory equipment. If you have any questions about this product by EcoDecors, contact us by completing and submitting the form below. If you are looking for a specif part number, please include it with your message.